Take the High Road to China… for an adventure you’ll never forget. 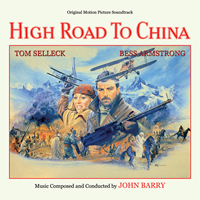 BUYSOUNDTRAX Records present HIGH ROAD TO CHINA, featuring music composed and conducted by John Barry for the 1983 action adventure film directed by Brian G. Hutton (SOL MADRID, WHERE EAGLES DARE, KELLY’S HEROES), based on a book by Jon Cleary, starring Tom Selleck, Bess Armstrong, Jack Weston, Wilford Brimley, Robert Morley, Cassandra Gava and the great Brian Blessed as the Suleman Khan. Released in 1983, HIGH ROAD TO CHINA begins in Istanbul, 1920 and tells the story of spoiled heiress Eve Tozer (Bess Armstrong) who has come from London to find her father, Bradley (Wilford Brimley), a brilliant inventor/entrepreneur who has gone missing. The London courts have been convinced by Bradley’s former business partner, Bentik, that he is dead and if he can’t be located in three weeks, his assets will go to his ex-partner. And these assets include Eve’s trust fund and inheritance. Following her father’s trail, which leads outside of Istanbul, Eve is forced to hire a down-and-out alcoholic pilot, Patrick O’Malley (Tom Selleck, in his first starring motion picture role) and his partner, Struts (Jack Weston) as they appear to be the only reliable pilots in the whole country. Taking flight in O’Malley’s planes, named Dorothy and Lillian (after sisters Dorothy and Lillian Gish, who were popular actresses of the time), the trio travels from Afghanistan, into Nepal, where they cross paths with the Suleman Khan (Brian Blessed) and finally into China, where they must outwit a Chinese warlord. Additional obstacles are thrown in their path by Bentik, who is determined to prevent them from finding Bradley and returning to London in time. To support the romance and adventure elements of the film, producers Raymond Chow and Fred Weintraub turned to veteran composer John Barry. His music for HIGH ROAD TO CHINA includes an exciting flying motif and a love theme that could only been have been penned by one man, along with the kind of travelogue style music the composer would write for a James Bond film and adaptations of various period source cues indicative of the 1920s. Born in 1933, in York, England, composer John Barry is known the world over for his work on the James Bond series, beginning in 1963 with FROM RUSSIA WITH LOVE and scoring nearly all of the Bond films up until 1987 with THE LIVING DAYLIGHTS. He has received the Academy Award four times for his work on BORN FREE, THE LION IN WINTER, OUT OF AFRICA and DANCES WITH WOLVES. He has also received a Grammy for his score to DANCES WITH WOLVES. In addition, he has been nominated multiple times for his work by BAFTA, EMI, the Emmys and the Golden Globes. In England, he was awarded the title of Officer of the Order Of The British Empire for his services in music. In France, he holds the title of Commander in the National Order Of Arts And Letters. He has composed music for films such as ZULU, THE IPCRESS FILE, BORN FREE, THE LAST VALLEY, MARY, QUEEN OF SCOTS, ROBIN AND MARIAN, BODY HEAT, FRANCES, CHAPLIN, INDECENT PROPOSAL, ENIGMA and many more.